Located at 85 Piccadilly, the collaboration between chef Ollie Dabbous and Mayfair wine boutique opened its doors in April 2018. With incredible views over Green Park and a relaxed setting, it’s the perfect place to savour seasonal cooking complemented by one of the UK’s most comprehensive wine lists. The restaurant is set over three floors with stunning woodwork craftsmanship dominating the interior throughout. The lighting is dimmed perfectly to create that a city-meets-nature ambience. The top two floors are enclosed by large clear windows which offer impressive views of Green Park and bustling Piccadilly, while the basement floor houses a cavern-style cocktail bar. We were seated on the ground floor and were therefore offered the A La Carte menu (the upper floor has a fixed menu with numerous courses). We ordered various starters including the pumpkin soup with cornish gouda agnolotti (£18) and the hand-cut pasta with seasonal white truffle (£30). Both were delicate, flavourful and very much deserving of the Michelin Star the restaurant was awarded just six months after opening. 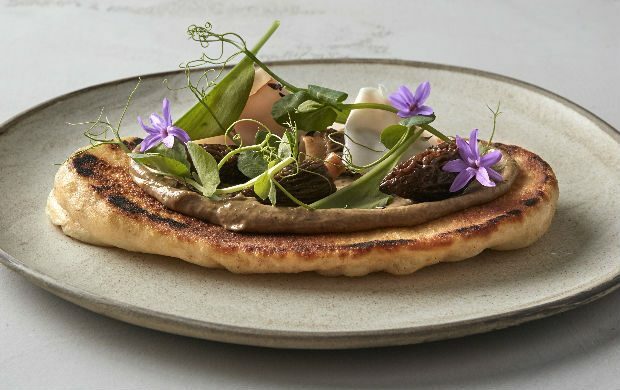 Ollie Dabbous set out to make ‘simple, seasonal and refined’ dishes and he certainly has achieved this feat. For the main course we tried the 50 day-aged short-horn beef ribeye cooked over charcoal (£48pp). We flitted over how we wanted it to be cooked (and definitely confused the obedient and very helpful staff), so we were surprised when it came cooked to our specification. The steak was accompanied with rapeseed béarnaise, crispy potato cake, baked shallots, smoked bone marrow and pickles. It was one of the best steaks I’ve ever had, tender and perfectly cooked. The potato cake and shallots were also a delight and timely cooked. Drinks started in the cocktail bar below and we ordered the Blunderbuss (£16.50) a Jonny Walker based drink with brown butter, Cocchi Americano and Pedro Ximenez. It was a much-appreciated recommendation from the staff which set the tone for their excellent recommendations throughout the night. Considering the extensive wine list, this strategy came in handy. Nobody can fault the wine. With the starters we drank a sauvignon blanc and for the steak we had a fruitful red from Burgundy. We stuck with French but you can choose old and new world wines from all types of regions. Seasonal, light, high-quality food in a well-conceived setting. Great red wine and knowledgeable waiters.